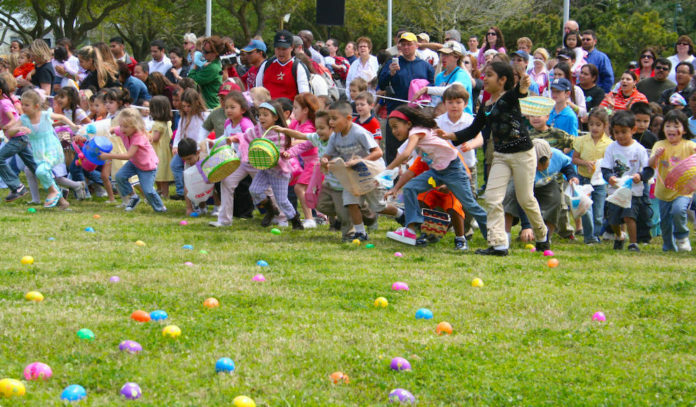 If you are looking for all the eggtivities and egg hunts in Houston, we’ve got you covered with our list of favorite Easter events. Easter EGGstravaganza at Blessington Farms | Saturday, April 13; Sunday, March 14; Friday, April 20 and Saturday, April 21 – Enjoy combining Easter egg hunts and picking your own strawberries at Blessington Farms. Activities also include hayrides, barrel trains, giant slides, and animal encounters (including chickens, goats, and camels). Eggs can be redeemed for candy and prizes. $20 per person; children 18 months and under are free. The egg hunt is $3 per child with paid admission to Farm Funland. 10am each day. Easter Egg Scramble at Jordan Ranch | Saturday, April 13 | FREE – Adults and children are invited to hunt for golden eggs with cash yolks at Jordan Ranch’s Easter Egg Scramble. All can enjoy additional family activities, including photos with the Easter Bunny, a petting zoo, photo booth, face painters, and balloon twisters. Noon to 2pm. EggTivities at The Woodlands Children’s Museum | Friday, April 19 and Saturday, April 20 – Bring the camera to snap a picture with the Easter Bunny and enjoy 2 days of Easter-themed arts and crafts at the Woodlands Children’s Museum. Tickets are $6. 10am to 2pm. An Old-Fashioned Easter at George Ranch Historical Park | Saturday, April 20– Travel back in time for the 23rd annual Old-Fashioned Easter at the George Ranch Historical Park. Activities include a game of basket egg toss, making Victorian Easter cards, an Easter egg hunt and more. Tickets range from $10 to $15. Times vary. 10am. Easter Egg Hunt at 7 Acre Wood in Conroe | Saturday, April 20 – Visit the petting zoo, play on the zip lines and more for free. Tickets can be purchased for meeting the Easter Bunny, pony/train rides, carnival games, paintball, concessions, face painting, and plenty of other activities. The vendor market is free for anyone to visit. Prices vary per activity. 10am to noon. Easter on the Ranch at Smith Ranch in Katy | Saturday, April 20 – Hunt for eggs, meet the Easter Bunny, feed the animals and more at Katy’s Smith Ranch. Kids and adults alike can expect fun on the ranch in the form of paddle boats, bounce houses, and concessions available for purchase in addition to the usual Easter festivities. Feel free to bring your own basket for the egg hunts. Tickets are $10. Times vary. Annual Easter Event at Old Town Spring Shops | Saturday, April 20 | FREE – Bring your Easter baskets as the shop owners in Old Town Spring hand out candy to all the kiddos. 11am to 3pm. Easter at Hermann Park | Easter Sunday, April 21 – Make your way over to Hermann Park for a scenic breakfast on Pinewood Cafe’s patio followed by an Easter egg hunt, a ride on the Hermann Park Railroad, and a pedal boat ride. Space is limited and advance ticket purchase is required. 8:30am. Easter Brunch & Egg Hunt at Downtown Aquarium | Easter Sunday, April 21 – Celebrate Easter with an egg hunt, photos with the Easter bunny, and a delicious buffet with over 40 items to choose from at the Downtown Aquarium. Reservations are required. 10am to 3:30pm. Easter in the Gardens at Moody Gardens | Easter Sunday, April 21 – Children 9 years old and younger are invited to participate in an Easter egg hunt and enjoy other activities like games, a petting zoo, a buffet, and a visit with the Easter bunny at Moody Gardens. Included with general admission. 11am to 3pm. Easter Celebration at Galveston Island Historic Pleasure Pier | Easter Sunday, April 21 – Spend Easter Sunday with a view of the beach when the Galveston Island Pleasure Pier hosts their Golden Easter Egg Hunt and a movie screening of the family-friendly movie, Hop. Prices vary per activity. 11am to 8pm. Kingwood Easter Craft Show at Town Center Park | Easter Sunday, April 21 | FREE – Enjoy a family-friendly Easter Sunday market filled with crafts, local artisans and vendors, and activities for the kids at Town Center Park. 2pm to 6pm.